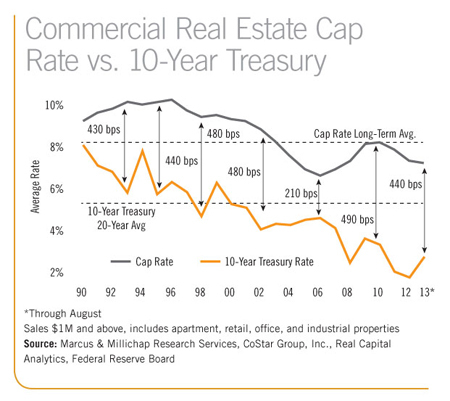 Are Commercial Real Estate Cap Rates Tied To Treasury Rates? The most important financial change of anyone alive today has been the reverse of the 1970’s decade of inflation and subsequent declining interest rates since the 1980’s. The decline in interest rates the last three decades has impacted commercial real estate due to the principal of “Opportunity Cost”, because as alternative investment returns decline, commercial real estate prices must increase to result in comparable lower returns. The Cap Rate is short for capitalization rate, which is the rate of return used to derive the value of an income stream. The formula is Net Operating Income divided by Price equals Cap Rate. The chart below shows the cap rate since 1990 compared to the 10 year Treasury rate. The conclusion is that Cap Rates have trended lower as Treasury rates have trended lower, with a spread ranging from 201 basis points to 490 basis points. A reasonable expectation is that as the economy gets stronger, interest rates could increase, and Cap Rates will increase and prices will come down, assuming net operating income does not change. Source: www.louisianacommercialrealty.com; chart from A Stronger Asset by William Hughes.